Oakwell Hall in the village of Birstall is furnished as a family home of the 1690s and offers visitors a real insight into a post-English Civil War household. The hall was built was John Batt to the usual post-medieval plan of a central hall block flanked by crosswings. A recarved stone dated 1583 probably indicates the date of construction. The estate had been purchased by his father, a receiver of rents to the Savile family, who lived at Howley Hall, in Batley. The impressive Great Hall originally had two storeys, but in the mid seventeenth century, John Batt's grandson removed the ceiling and inserted a gallery and a large mullioned and transomed window. The interiors were restored to their early seventeenth century condition with the aid of an inventory of 1611. During the restoration the original painted panelling of the Great Parlour and the Painted Chamber was revealed from under many layers of varnish and paint. The hall is reputed to be haunted by the ghost of William Batt, the owner of the house in 1684. He was a bachelor whose widowed mother, Elizabeth Batt, lived at Oakwell. 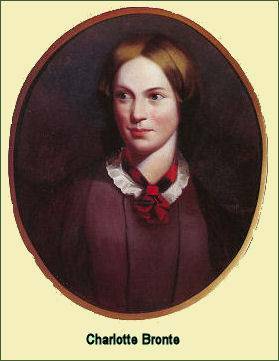 The Victorian writer Mrs Gaskell provided an account of the story in her "Life of Charlotte Brontë. 'Captain Batt was believed to be far away; his family was at Oakwell; when in the dusk on winter evening, he came stalking along the lane, through the hall and up the stairs, into his own room, where he vanished. He has been killed in duel in London that very same afternoon of December 9th 1684." Formal gardens including a herb garden surround the hall. Within the 110 acres (0.45 km2) are many diverse environs that make up the Country Park. Woodland, streams, pasture land, ponds and bridleways. There are several walks around the park with nature trail markers. Along the walks, are information points giving details of the flora and fauna. One walk out of the park leads to the site of the Civil War Battle of Adwalton Moor, another to Red House Museum. The site also includes a visitor centre, gift shop, picnic sites, playgound and countryside centre. 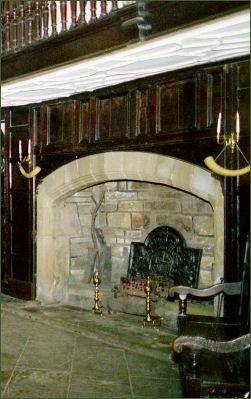 Oakwell Hall was used as a girl's boarding school in the nineteenth century, Ellen Nussey, a close friend of Charlotte Bronte attended the school, the two friends had met at Roe Head School near Mirfield. 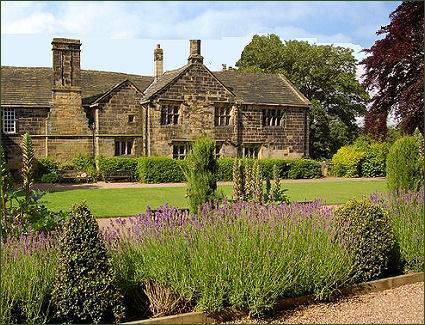 Charlotte visited the hall in the 1830's and was inspired to use Oakwell Hall as the setting for the manor house - Fieldhead, in her novel Shirley.